Sunset Pigment Ink Petal Point and Christmas! 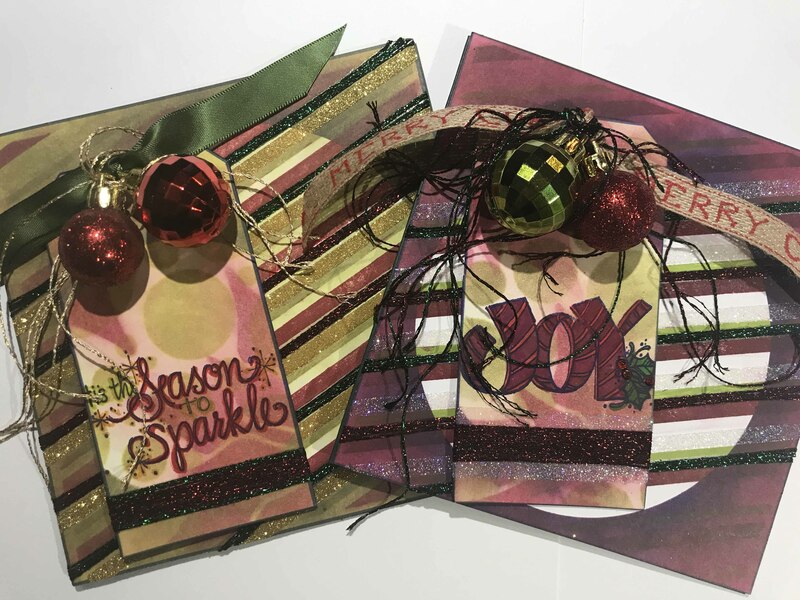 Hello everyone – Cathie Allan here today on the Creative Scrapbooker Magazine blog playing with the Sunset pigment ink petal point collection from Clearsnap. Events …. I love events. I love watching everyone get together as friends to enjoy their hobbies, their passions. At a scrapbooking/papercrafting event the sharing of ideas is amazing. From the moment they unpack their tools and toys, sit down and begin creating the sharing begins. Everyone learns from each other and then there is the classes, the demos, the make’n takes that you can participate in to further the creative experience of the event at the Winnipeg, “Scrapchicks” gone wild event, I taught two classes and did a make’n take in the booth where I taught a fun background technique and they created a Christmas tag using that technique. As I teach, I create with them so I ended up with a “pile” of tags for myself. Once they came home some of them became cards by creating another very cool background on a 6X6 piece of Super Stock on which I attached one of the tags I created at the event. For your “blog pleasure I am going to step out the background for the 6X6 background. This background is loaded with shimmer because …. here comes Christmas and Christmas is a great time to “get your shimmer on”! 1. Set up your Cathie Allan, Position-it2 for a cling stamp image. This tool embraces wood stamps, clear stamps and cling. Using tape and paper masks, stamp each stripe of this awesome “candy cane” like image from Impression Obsession. Using colors from Clearsnap’s “Sunset” pigment ink, petal point. Repeat until the image is complete. 2. Slide a piece of non-stick, heat resistant, crafting sheet under your project (I had only taped on the left and bottom of my Super Stock) and iron with a hot dry iron in short bursts. The base is heat resistant but I am careful to be gentle with it … that iron is hot. Place a piece of scrap paper or a piece of paper towel between the iron and the project to keep your iron clean. 3. Cut a circle as shown and place your circle “mask” on the project as shown. Using the “chianti” section apply color with your stylus and white foam tip reserved for dark red pigment ink. Apply the color from the mask, out. 4. Now add midnight blue as shown, applying the color in from the mask, out. 5. Remove your mask to reveal. 6. Remove your project from the board and iron again. 7. Lay a strip of 3mm “Be Creative” tape just under an olive green stripe. Do this on both sides. Using your favourite, sparkly fibre (mine is WonderFil’s, dazzle) and wrap, completely covering the tape to create a very sparkly, fibre ribbon. 8. Lay a strip of 5mm, “Be Creative” tape as shown, above the green stripe and after removing the backing, sprinkle with Clearsnap’s, Twinkle Dust, Sugar Shimmer. Burnish the glitter with a clean finger. 9. Repeat steps 7 & 8 as shown in the final project. I have made 2 of these, “oh so fun, sparkly” cards so far …. now to do a dozen or more, lol!! Happy Happy getting ready for Christmas everyone!